This project is funded by the International Fund for Ireland Personal Youth Development Programme. It provides individually based activities to young people who are considered harder to reach to support them to overcome personal challenges. 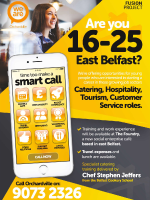 The project enables young people to develop their employability and communication skills by offering work placement and training opportunities in a variety of areas including catering, hospitality and tourism although is not limited to these areas. Young people can choose the number of days and sessions they attend and travel expenses are available to young people to assist them to fully participate.